Despite all the technological advances of the computer age, sometimes it’s most convenient to fall back on old practices. Palatography – demonstrated here my good friend in the video – is not an art form but a method of scientific inquiry. Linguists researching articulatory phonetics – how we physically make sounds – can use a mirror to look at the marks left by paint when their research assistants say words, and deduce what their tongues did during that word. The ‘paint’ is actually charcoal-based or a similar edible dye, so it’s not quite as bad as it looks, but it’s still an invasion of privacy that requires social comfort as well as a deft touch. Why would you do that instead of using technology? In truth you wouldn’t often need to. In a lab setting you can find out a fair amount by closely analyzing the sound’s wave form, graphed using specialist software like Praat. Various methods use very complicated technology to make scans, such as an MRI. Electropalatography is an extension of the tradition, placing a reader shaped like a retainer into the mouth, meaning no tickly paintbrushes and easy comparisons between tests. But all of these require having electricity, money for the equipment, and foresight that you might need to do such tests. 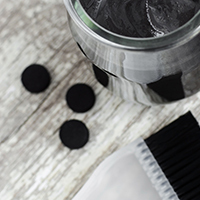 For a one-off situation in a rural area, some wet charcoal and a brush may be all you can get your hands on.